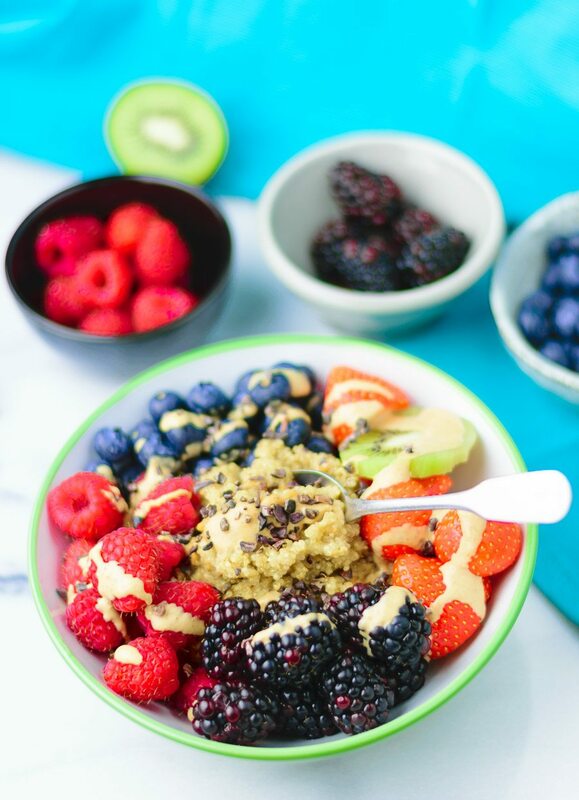 My easy Everyday Quinoa Breakfast Bowl is an awesome way to have quinoa for breakfast. It’s a vegan and gluten free recipe that combines quinoa cooked in almond milk with fresh fruit and a sprinkle of nut butter. Charge your batteries to full with this breakfast quinoa. There are not too many breakfast recipes on Contentedness Cooking yet, so I think it’s a good time to add one. I’m sure most of you guys probably know my Breakfast Bowl or the Breakfast Bars. You can also try my Vegan Apple Crumble, if you haven’t done so yet. Today, I have an easy everyday quinoa breakfast recipe to give another special twist to your breakfast options. Why quinoa for breakfast, you ask? Quinoa is one of the healthiest foods of the world. That means this easy recipe is full of benefits for you. And not only from the Quinoa. You can add your favorite fruits, think of strawberries, raspberries, blue berries, you name it. It also shows that quinoa breakfast recipes are basic but not boring at all. You can play around with your favorite fruits, sprinkle your bowl with your favorite nut butter. You love peanut butter? Or cashew butter? Hazelnut or almond? Or even if you don’t like nuts, just use sunflower seed butter. 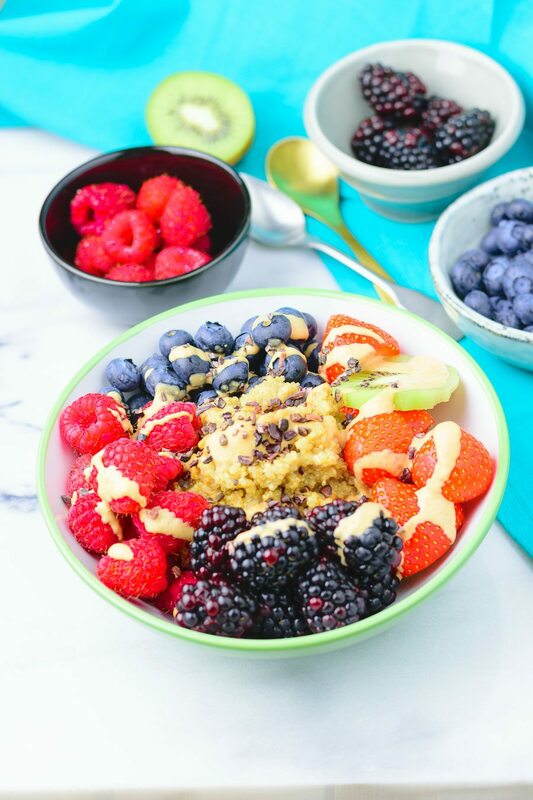 If you include the Everyday Quinoa Breakfast Bowl into your morning regime, you not only get all the nutritional benefits, you will also have more fun and be excited about breakfast, I promise. I mentioned above that quinoa has a lot of nutritional benefits. Quinoa is among the healthiest foods in the world. It is high in fiber and protein, as well as gluten free. So it’s perfectly accessible also for people with gluten intolerance. Everyone can enjoy quinoa without restrictions. You see I could give you a long list of amazing things here. If you want to read more about the health benefits, have a look at this article “11 Proven Benefits of Quinoa” from Authority Nutrition. 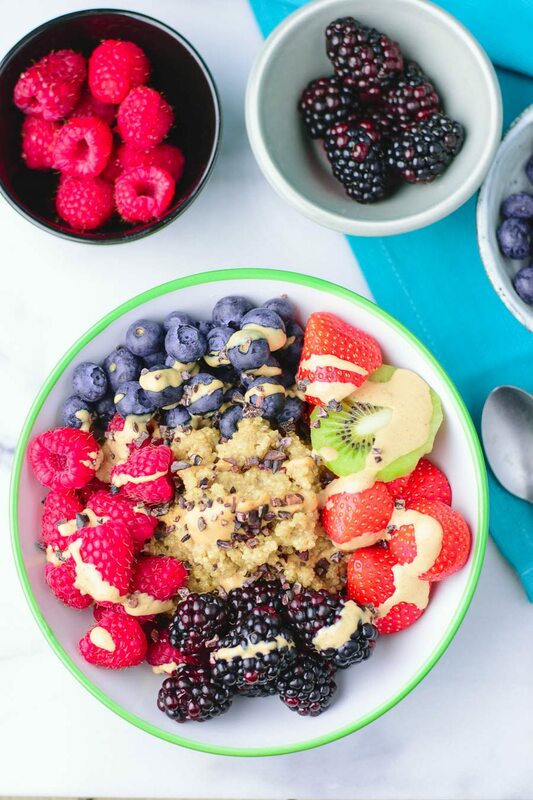 You only need 4 basic ingredients and 2 easy steps to make this Everyday Quinoa Breakfast Bowl. 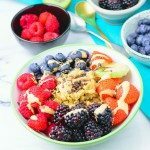 If you want a fancier bowl then add everything you desire in a delicious, satisfying breakfast that will make you full and energize you for hours. When you eat something delicious, healthy and full with good benefits you definitely will be able to keep a fantastic performance in all challenges during the day. This recipe is an almost fat free recipe if you use just the fruits and the quinoa cooked in almond milk. The only fat comes from the almond milk, no additional fat included. This is not only a low fat but also an oil free recipe. So no oil is necessary for all you to want to watch the oil intake. This Quinoa breakfast recipe is so easy to make in no time. All you do is to cook the quinoa according the manufacture directions. However do it not with water but with the almond milk. After this you simply assemble your bowl with fruits and the nut butter and cocoa nibs optional. Now look at these colorful pictures. 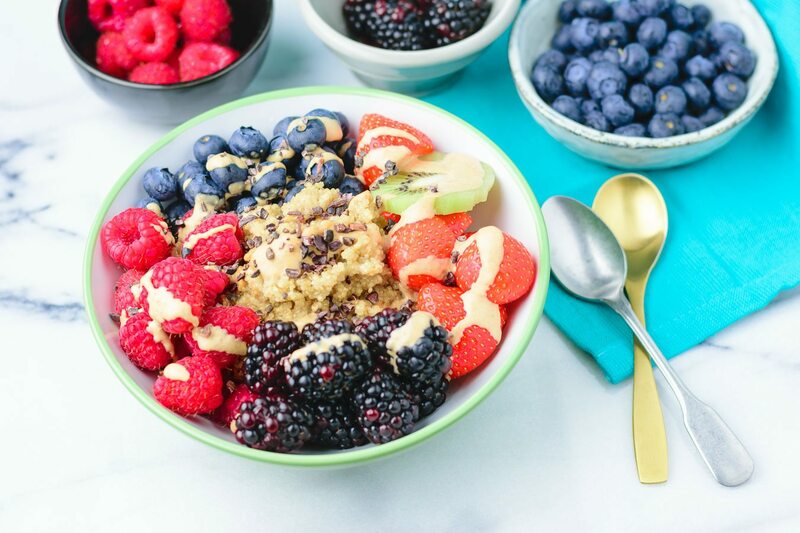 The Everyday Quinoa Breakfast Bowl will definitely brighten up your mood, no matter if you are a morning person or not. If you give this a try, let me know and snap a picture. Let’s meet on Instagram or Facebook. Happy eating, cheers! Cook the quinoa according to the manufacturer’s instructions. Just use almond milk instead of water. Wash you favorite fruits. Combine in a bowl together with the cooked quinoa. Sprinkle with nut butter and optional cacao nibs. Thank you, Catherine, you, too! With this recipe you will love quinoa! I promise, Laura! how delicious and wholesome is this!! Love your photos too, so inviting! We ran a healthy living link party, it goes live Wednesdays, 5pm PST until Sunday 7pm. I would love for you to share this recipe! Thank you! It was absolutely delicious! Hearty and healthy! A GREAT way to start the day off right! I’ve never had quinoa for breakfast before but adding a bunch of fresh fruit seems like the perfect way to do it! Awesome that’s would I like to hear, Liz! I don’t know why I have never had quinoa for breakfast. I love it and I really love how you presented it here. The fruits and the maple syrup add the perfect touch of sweetness. Thanks Joanie it was absolutely delicious! I hope you try it! Ok Florian, this is absolutely the prettiest bowl of quinoa I’ve ever seen! All these beautiful colors and vibrancy! Stunning! I would be very happy being served this beauty each day. I’m not typically a quinoa fan but making it sweet like this with all the lovely fruits just may convince me. It’s a fantastic idea! I love all of your pics and how simple this recipe is! Adding nut butter is a fantastic idea as well! Thank you so much, Brandi, for the big compliments for my pictures! Means a lot to me! I hope you get the chance to try it! What an amazing way to start the day! Indeed! It’s the best way! I use quinoa for savory but this breakfast has my attention. I never worry about fats, it’s the sugars that are the “killers”. So I’d most def use the Almond butter. The fruit takes care of the sweet issue. I love this, Florian! It looks super healthy and tasty too. I have not tried quinoa for breakfast yet. Just got into these bowls with oatmeal, now I have to try quinoa! It’s a lovely twist, Tara! Awesome, can’t wait for your feedback, Del! Oh this looks so wonderful! And it probably tastes even better!! What camera do you use to snap all those pretty pictures? Hi Layla! I have a Nikon D3300!